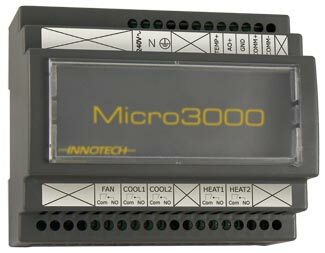 The Micro 3000 0-10VDC output is selectable for Economy Cycle (free cooling), Heating or Cooling applications. Schedules are set using the Micro 3000 Control Station. Only M3K02 & M3K04 models with Real Time Clocks can create schedules. 1 Speed Fan, 2 Cool, 2 Heat, 0-10V Analogue Output. 1 Speed Fan, 2 Cool, 2 Heat, 0-10V Analogue Output with 365 Day Battery Backed Time Clock. 3 Speed Fan, 1 Cool, 1 Heat, 0-10V Analogue Output. 3 Speed Fan, 1 Cool, 1 Heat, 0-10V Analogue Output with 365 Day Battery Backed Time Clock.